Prospect Foundry located in Northeast has ambitious goals to save energy and reduce the company's environmental impact on the neighborhood. In 2016, the foundry received funds from the Minneapolis Green Business Cost Share program to replace all of the facility’s lights with motion-sensing LEDs. The foundry received cost share funding again in 2017 to repair leaks in their compressed air system. Combined, the two projects save Prospect Foundry $180,000 on electric bills and prevent 15,000 tons of carbon dioxide emissions from entering the atmosphere each year. Watch this video to hear Darrin Carlson share his story on how the program benefited his business. Do you also have an energy efficiency project in mind for your building, and need funds? The City of Minneapolis' Green Business Cost Sharing Program, is offering up to $100,000 per building to help fund energy efficiency and renewable energy improvements in Minneapolis buildings. The funds, which function like grants, are available for projects such as heating, cooling, and ventilation equipment, lighting, solar installations and other energy saving technology upgrades. Priority will be given to businesses in Green Zones of Minneapolis, buildings participating in the Minneapolis Energy Benchmarking program and Building Energy Challenge. 38 Projects Funded for Energy Efficiency in 2017! 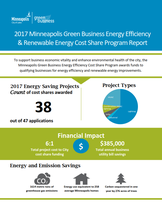 The Minneapolis Green Business Cost Share program funded nearly twice as many projects in 2017 as in 2016, saving businesses $385,000 in utility bills and avoiding 1614 metric tons of greenhouse gas emissions annually. Lighting conversions to LEDs made up the majority of funded projects, as they are the "easiest projects to do with the quickest payback." Other major projects included boiler upgrades, solar photovoltaics, air compressor optimization, and rooftop HVAC equipment replacements. The Cost Share report provides details on the program's spending, its impact, and case studies of funded projects. Read the full report here. Your warehouse or distribution center 1-100 ENERGY STAR score(s) will likely change in August when EPA updates the algorithm to reflect changes in the marketplace. ENERGY STAR scores are based on nationally representative survey data from the Commercial Building Energy Consumption Survey (CBECs), which is administered by the U.S. Energy Information Agency every four years. The ENERGY STAR scores are periodically updated to reflect these changes in the marketplace. The 2018 score change will be the second update since the warehouse and distribution center model was launched in 2004. It will continue to cover both refrigerated and unrefrigerated warehouses. Register to attend the free one-hour webinar on January 25, at 1:00 PM Central Time. 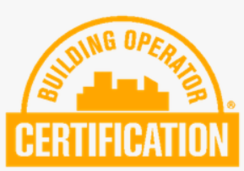 Sign up for Building Operator Certification Training! Want to improve the comfort of your office while simultaneously improving the efficiency of your building? Sign up for Minnesota's Building Operator Certification (BOC) training series! BOC is a nationally recognized training and certification program focusing on energy efficient building operations and preventative maintenance procedures. Training includes nearly 61 hours of classroom and project work in building systems operation and maintenance. 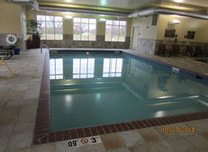 Training begins at 8:00 a.m. and ends by 4:00 p.m. Refreshments will be provided. Tuition must be paid prior to the first day of class. Xcel Energy’s Solar*Rewards Program provides incentives to Xcel Energy customers who install solar energy systems. It began taking applications on Jan. 8, 2018 and will provide recipients with 10 years of annual incentive payments based on the solar energy system’s annual production. Solar*Rewards is available to Xcel customers on a first-come, first-served basis. 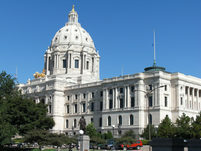 Governor Mark Dayton signed an executive order late last year directing state agencies to reduce fleet fossil fuel consumption, building energy use per square foot, and total greenhouse gas emissions by 30 percent within the next decade. Learn how the State plans to reach its goals here. Commercial and hospitality buildings typically cycle between periods of very heavy hot water use and periods of low to no hot water use. To ensure an immediate supply of hot water at all times, building managers often override existing recirculation technology that was designed to control and reduce pumping and heating costs. To address this challenge, the Center for Energy and Environment (CEE) conducted a CARD-funded study to assess the effectiveness of new demand control systems installed at six sites. CEE Senior Research Engineer Ben Schoenbauer will provide a technical overview of study findings, including the performance of field installed systems, recommended approaches for building screening, non-energy benefits of the new systems, and specific recommendations for utility CIPs. The 28th annual Energy Design Conference & Expo will be held Feb. 19-21, 2018 at the Duluth Entertainment Convention Center. The deadline for early bird registration is Feb. 1. Once again the conference will provide the latest in energy-efficient building and technologies, renewable energy, best practices, and responsible design. There will be 44 sessions from some of the top educators in the energy field, as well as plenty of opportunities to network. The Minnesota Department of Commerce will be an exhibitor at the event. Read more.